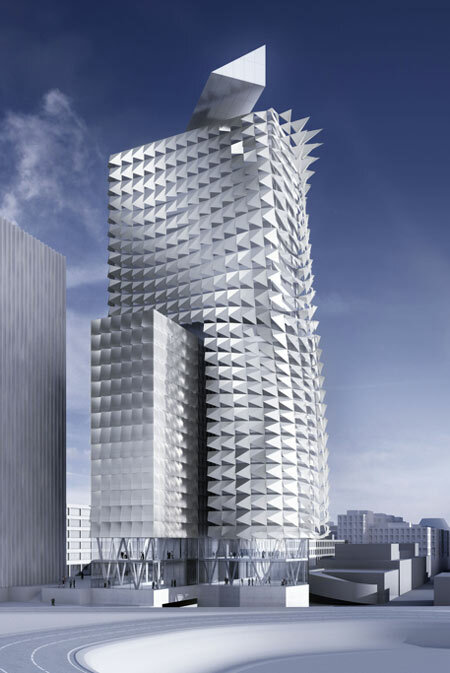 Like most of the work from Austrian firm Coop Himmelb(l)au, this proposed 30-story Town Town tower in Vienna is jagged and imposing. But where LA’s High School #9 and the Akron Art Museum are meant to stand out like a Judas Priest costume circa 1982, this tower’s built for stealth. In fact, the faceted metal skin is invisible to radar. Airport. Another tower in this precise location could potentially interfere with the airport’s radar systems, scattering the signals unpredictably and potentially damaging its ability to visualize incoming and outgoing aircraft. Like stealth fighter plane design, the 3-D facets on the building act as radar scatterers, bouncing incoming waves in many directions–just not back at the radar dish itself, making the building unobtrusive to the electronic systems (but unmissable for everyone else). Would the residents of this building want to be invisible to the radar screens of inbound planes, though? Let’s hope there is a large blinking light pole planned for the rooftop. There is another benefit to the rippling skin, which Coop Himmelb(l)au call “climatic skin,” it shades the office spaces inside, regulating their temperature and reducing the building’s carbon footprint. (Operable windows–a sadly scarce feature of many new office towers–help too.) The panels are also laminated with ultra-thin photovoltaic cells, which will supposedly generate 264 megawatt-hours of energy per year. A big wind turbine on top makes even more. All told, the building generates about 2,000 MWh per year–more than the building is projected to use.